Retargeting for real estate: what is it? How does it work? How does retargeting for real estate marketing work? Imagine you’re thinking about a new car. You wander a dealer’s lot and a certain little red convertible catches your eye. You kick the tires, open the trunk and even sit in the driver’s seat. But you’re not quite ready to buy, so you leave. Later that day, you see that same red convertible in your parking lot at work. Then it’s driving in the lane next to you on the way home. Then it’s parked along your street. This is the real world version of the digital tool called retargeting. You expressed interest in that car, and so the dealer is making sure you see it again to encourage you to return and buy. And the numbers show that it works. Retargeting is a powerful tool for real estate agents, too. Studies show there is a window of time that is anywhere from two weeks to four months when consumers are doing home-buying related activities online. They’re checking the portals or using mortgage calculators. And in that time, they may visit your site. But only 2% will actually “convert,” or contact you. You need to encourage the other 98% to come back! 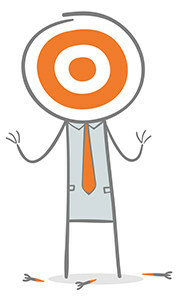 Retargeting works by showing your online ads to those viewers who have visited your website. As your potential customers continue to search the web after they’ve left your site, they will find your ad ‘following’ them based on the searches they conduct. 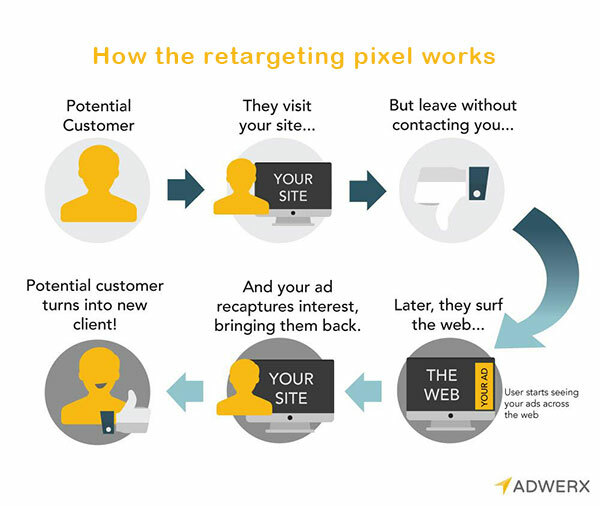 Adwerx retargeting uses a tiny bit of code called a pixel. The pixel is unobtrusive — your site visitors won’t notice it and it won’t affect your site’s performance. Every time a new visitor comes to your web site, the pixel inserts an anonymous browser cookie. Later, when your cookied visitors are on other web sites that allow ads, the cookie lets Adwerx know to serve your ad. Seeing your ad as they browse the web is just like you seeing that red convertible… it keeps your real estate listing or your personal brand top of mind as that buyer or seller gets closer to the moment of decision. Even encouraging the consumer to learn more about you. Your customers have already told you what they want. By retargeting them, you are helping them to get it. And if you are already running a Zip code campaign or digital listing ad with Adwerx, you already have access to retargeting! Simply log into your account and look for Quick Links to check your retargeting settings. Which kind of sphere of influence do you have? So how do I ad a pixel to my add ? Hello Jesus, thanks for the question! Simply log into your Adwerx account. At the top of your dashboard, you’ll see a message to “Enable your Retargeting Campaign.” Simply click and follow the prompts from there. Thanks so much. I thought this was what I was getting when I purchased AdWerx. Why do I need to purchase this retargeting stuff on top of my AdWerx ads? This does not make sense. Hi Steve, you DO get this with your Adwerx brand campaign! Simply log in to your account dashboard and you’ll see a message at the top of the screen that says “Enable your retargeting pixel.” And go from there. Thanks! Hello Negasi, we are here Mon-Fri 9am-6pm EST, and Sat 9am-5pm EST. Feel free to give us a call whenever you are free at 888-746-5678. Thank you! Can the recapture code be used on your business Facebook page? Hi Nick – great question. Unfortunately, no. Facebook doesn’t like people inserting code into their pages. You’ll need your landing page or web site. Hope that helps! I get it & LOVE the possibilities of being in front of visitors after they’ve left my website. I’ve added it to all the pages possible. Thanks! This is amazing, thank you for sharing this one. I should take note of this.